Giving Tuesday serves as a launch pad for many nonprofits as they move into their busiest time of the year. But not all organizations use it as such. While there’s no argument around the day’s success, some organizations fear the transition between Giving Tuesday and their year-end initiatives, viewing them as separate campaigns. When you’ve just made all this hype about Giving Tuesday, how do you get in touch again (and so soon) about year-end fundraising? Our recent analysis found that Giving Tuesday donors and donors who give during the last five days of the year are actually from different demographic groups. So while it can feel like you’re speaking to the same people across your platforms, keep in mind that the folks who tend to give during the last five days of the year actually tend to be pretty unique. That said, it’s still important to present a smooth transition from Giving Tuesday to year-end. Here are three things to keep in mind as you leverage your Giving Tuesday campaign results for your year-end conversations. The right messaging post-Giving Tuesday has the power to tie your fundraising pushes together in a seamless way. Thanks again for your generous contribution to our Giving Tuesday campaign. Your support helped us reach our goal of $500,000. That means we’re that much closer to launching our new pilot whale protection program. Now that we’ve gathered the funds needed to kickstart the program, we’re ready to send a team of diplomats to travel the globe and meet with various world leaders to discuss implementation. First stop, Denmark! But we can’t get there without your continued support. To get our team and equipment abroad we need your help. That’s why we’ve launched our campaign page with updates about our new goal. To help us protect pilot whales around the world, we ask that you share this fundraising page on your social platforms and tag three friends who you think might be interested in making a difference. This giving season, give the gift of life and protection for pilot whales. P.S. Giving to little ones this season? Don’t forget to shop our store of plush animals that your littles will love—100 percent of proceeds go to program implementation. It can pay to get a bit more granular with your presentation of Giving Tuesday results to help your community understand exactly why it’s important you don’t let your foot off the gas. 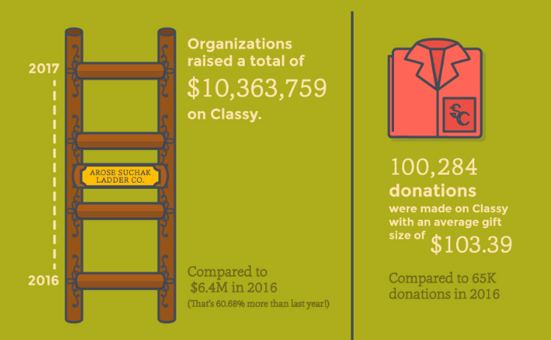 To share key data points in an email in a digestible format, consider creating a Giving Tuesday wrap-up infographic. Infographics are a great way to quickly communicate a summary of data points. This could also live on your blog or website. These images can also be shared on social media and serve as a great way to continue the conversation past the big day. Didn’t reach your Giving Tuesday campaign goal? That’s okay! Share what progress you did achieve and help your supporters understand why it’s urgent you make up for any lost ground. Were the funds you raised on Giving Tuesday earmarked for a specific purpose or program? What are some translatable examples of how the money you collected will be put to use? Was Giving Tuesday a way to kick off your larger campaign for year-end? What will you do with the funding you receive? Send honest and straightforward messaging between Giving Tuesday and year-end to let your community know exactly what the plan is and why you still need their help rallying support. One tip to gut-check your email messaging is to ask a peer outside of your organization for a quick review. What’s obvious to you in the weeds of fundraising for your cause might not be clear to someone who’s new to your cause or only interacted with you sparingly. We know a lot goes into year-end planning. To help you stay on top of your many to-dos we created a handy year-end fundraising checklist. Download your copy to make sure nothing important slips through the cracks.